We’ve all heard about the benefits of mindfulness meditation, but how many of us have sat down and committed to it? For many years, I was convinced I didn’t need to meditate – I only honked my horn 50 percent of the times I was cut off on the freeway, and thought five minutes of lying down at the end of yoga class was probably enough relaxation time in my busy life. However, having begun a (fairly rudimentary) mindfulness meditation practice, I now glimpse what I was missing. It’s not just about the ability to still myself when faced by endless distractions. Being able to see my emotions and responses form, then looking at them dispassionately, has served me well at work and at home. Mindfulness meditation was popularized in the West by Thich Nhat Hanh, a Zen Buddhist teacher, and his student Jon Kabat-Zinn, professor emeritus at the University of Massachusetts Medical School. With increased public interest in mindfulness, the San Diego County Library has collected a variety of books, audiobooks and DVDs on the topic, many recently published. You’ll find that several of the selections below are e-books: downloadable books that can be read on a smartphone, tablet, or computer using the free Libby app, available at SDCL.org, in Apple’s App Store, or on Google Play. “Mindfulness for Beginners: Reclaiming the Present Moment – and Your Life” (book with CD; audio e-book) is one of many books on mindfulness written by Jon Kabat-Zinn. When he established the Center for Mindfulness in Medicine, Health Care, and Society at the University of Massachusetts Medical School, Kabat-Zinn brought mindfulness meditation to a secular audience in the service of improving health outcomes. This introductory volume includes five guided meditations by the author. Longtime meditation teacher Rick Heller wrote “Secular Meditation: 32 Practices for Cultivating Inner Peace, Compassion, and Joy: A Guide from the Humanist Community at Harvard” to appeal to audiences who are not seeking a religious influence in meditation. Enhancing relationships with others, experiencing physical and psychological benefits, and improving resiliency are all benefits of a secular meditation practice. This book includes step-by-step instructions. 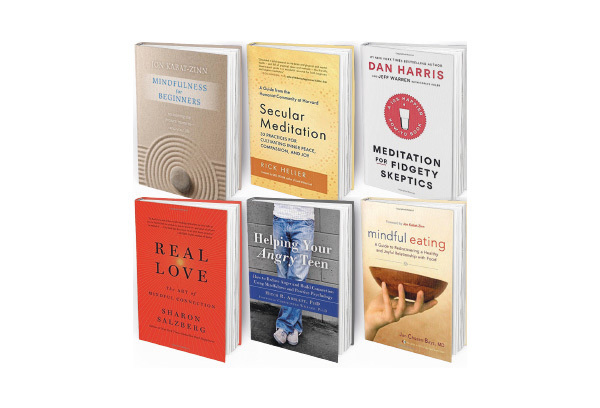 If you are both non-religious and easily distracted, you might try “Meditation for Fidgety Skeptics: A 10% Happier How-To Book” by Dan Harris and Jeff Warren, which is an audio e-book that can be borrowed and loaded to your phone or tablet. Audiobooks are a practical way to learn guided meditation without attending a group session. Mindfulness can be used in many areas of your life. The e-book “Mindful Eating: A Guide to Rediscovering a Healthy and Joyful Relationship with Food” by Jan Chozen Bays could help you focus on your body’s signals of hunger and satiety, experience increased satisfaction with what you eat, and examine your habits around food. This downloadable book includes a 75-minute audio program with guided exercises. You could also try working on your relationships with people you love by listening to the audio e-book “Real Love: The Art of Mindful Connection” by Sharon Salzberg. Lastly, you can improve your interaction with your teenager by reading the book “Helping Your Angry Teen: How to Reduce Anger and Build Connection Using Mindfulness and Positive Psychology” by Mitch R. Abblett, Ph.D. The tips inside give parents methods for getting through tense conversations with teens who are angry, withdrawn, or acting inappropriately. Even if you’re not a novice to mindfulness meditation, you still might enjoy learning more about the man who brought it to the West. “Walk With Me” (DVD and Blu-Ray) was filmed at Thich Nhat Hanh’s monastery in France, and follows a community that has eschewed possessions in favor of meditation. The monks and nuns (and, interestingly, their children) practice mindfulness in every part of their lives. Passages from Thich Nhat Hanh’s writings, narrated by Benedict Cumberbatch, form the audio background of this documentary. The Second Saturday performance series continues at La Mesa Library with the Rhinestone Grannies on Saturday, March 10 at 1 p.m. These dancing seniors will entertain with a combination of songs and costumes for St. Patrick’s Day. La Mesa Friends of the Library are the generous supporters of the Second Saturdays series. — Heather Pisani-Kristl is managing librarian of the La Mesa branch of the San Diego County Library. Call the library at 619-469-2151, visit in person at 8074 Allison Ave., or get information online at sdcl.org.